This story was produced by the Anaconda Leader as part of The Montana Gap project, in partnership with the Solutions Journalism Network. 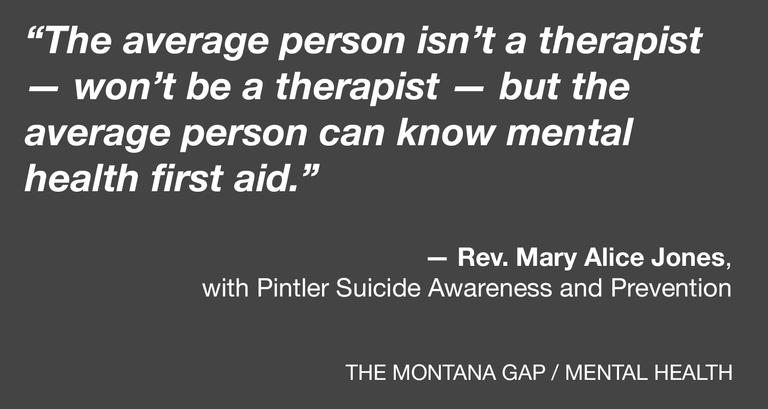 For many Montanans who are experiencing feelings of self-harm, their friends, family members, coworkers, neighbors, favorite baristas or even the stranger they just met on the street corner may be their first and only line of defense against suicide. Yet while the man or woman on the street may not have the formal education of a therapist, there are tools they can use to help prevent the next suicide — and organizations like Pintler Suicide Awareness and Prevention (PSAP) exist to help people learn what those tools are and how to use them, tools like mental health first aid. PSAP is a nonprofit, volunteer organization that formed in Anaconda in 2009 after several suicides that occurred within a short period of time shook the community. Its stated mission is to raise awareness about the high suicide risk in Southwest Montana and provide both educational opportunities for suicide prevention and intervention as well as grief support for people who’ve lost loved ones to suicide. One approach to mental health first aid is Question, Persuade, Refer (QPR), which Jones and other PSAP members as certified QPR trainers are able to teach anyone free of charge who’s willing to set aside one to two hours of their time. 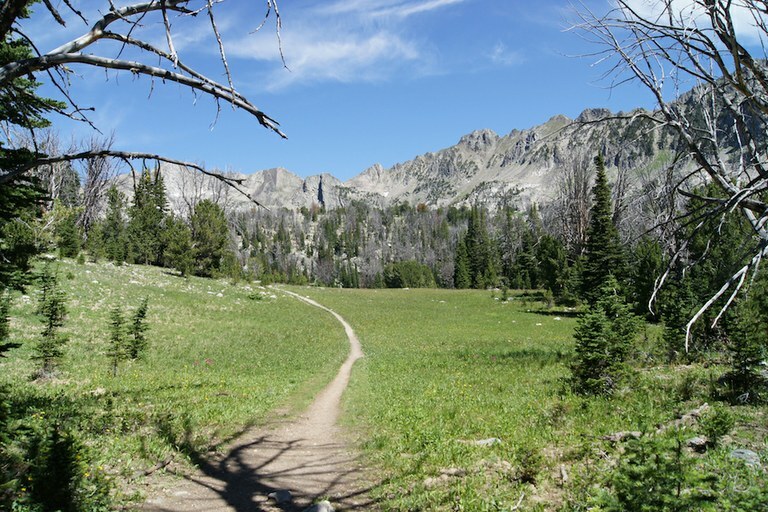 Beehive Basin in southwest Montana. If so, then under the QPR Institute’s model the next steps are to be able to persuade the person in crisis to get help and refer them to a confidential source of help, such as the 24-hour helpline, 1-800-273-TALK, the text message helpline, 741-741, their local public health department, licensed counselors or therapists in their area, or agency websites like the Substance Abuse and Mental Health Services Administration that has an anonymous treatment services locator tool. Yet whether talking about suicide with people who are contemplating suicide actually prevents them from attempting it or not is a question that remains unanswered, at least from an empirical standpoint. A 2015 article in the RAND Corporation’s RAND Health Quarterly entitled “Gatekeeper Training for Suicide Prevention,” analyzed the effectiveness of prevention efforts like QPR that are geared toward “gatekeepers” — individuals who have face-to-face contact with large numbers of community members as part of their daily life — and found this topic has largely been unstudied. The article cites a 2004 study of QPR training among university staff that showed more adaptive attitudes about suicide and intervention were “significantly associated with a lower probability of self-reported suicide attempts in the three months following program implementation,” though the article adds that the training encompassed more than QPR. The article also cites a 2007 study of the army of Serbia and Montenegro’s implementation of a similar program, which showed that deaths by suicide had decreased, though the study could not determine whether the program had caused that reduction or was merely correlated with it. If success were to be measured by the number of QPR trainers, however, then the model appears to be effective: according to the QPR Institute’s website, qprinstitute.com, there are over 2.5 million people who have completed the training, making it the most widely distributed such system in the world. The website further cites three studies published within the past 10 years that were reviewed by the National Registry of Evidence-based Practice and Policies which found that people who had completed QPR training had more knowledge, were more confident and better capable of engaging in suicide prevention skills such as active listening, asking clarifying questions and making an appropriate referral than they were before the training. One of the studies touted by the QPR Institute’s website showed that after state-mandated training in Tennessee, over 42 percent of participants in the training had identified at least one at-risk youth and intervened within six months of taking the course. The Montana Department of Health and Human Services (DPHHS) recommends QPR training for all middle school and high school staff, including teachers, paraprofessionals, bus drivers, custodians and food service personnel. All primary care providers also have to take mandatory suicide prevention training and suicide risk assessment training. For more information about Pintler Suicide Awareness and Prevention and to schedule a QPR training session, contact Dawnne Woodie at (406) 691-0332.